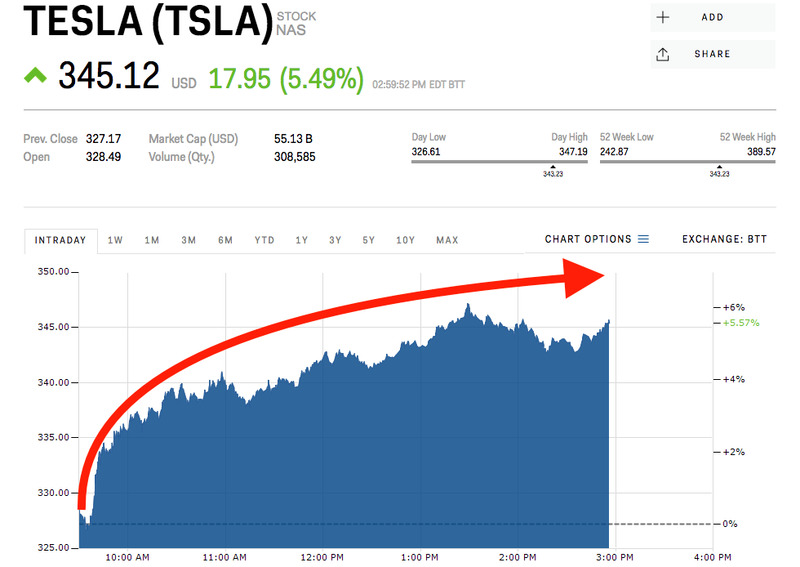 Tesla is up more than 5% Monday despite no significant positive news or Wall Street analyst upgrades. There were reports, however, that the company had to temporarily shut down Model 3 production last month. CEO Elon Musk spoke at SXSW over the weekend and sang a duet with his brother, Kimbal Musk. Shares of Tesla surged more than 5% Monday, despite reports the carmaker had temporarily suspended Model 3 production for four days last month. Such a stop is not unheard of. Most automakers schedule shutdowns into their production schedules to facilitate training, re-tooling of machines, or any other myriad of maintenance works. There were no significant upgrades or research notes from Wall Street analysts to possibly effect the stock, either. The Model 3 – touted as the electric car maker’s first mass market sedan – has been a source of headache for the company. In January, shares stumbled after reports Tesla was having difficulties fixing its long-disclosed battery problem in the new model. Tesla denied the reports. Monday’s spike also comes the day after CEO Elon Musk took the stage at SXSW in Austin to talk about his other company, SpaceX, and its race to colonize Mars.